If you manage multiple WordPress websites, updating plugins, themes, and the WordPress core can take a lot of time. You have to log into each site and then update WordPress, themes, and plugins. This WP Remote reviews discusses the features of this WordPress site management / update tool and explains how to use it. I manage about 40 WordPress website for two different clients. Keeping these websites updated with the latest WordPress core and plugins takes a lot of time. I wanted to find a WordPress management tool that would let me update all of my sites with the click of a button. WP Remote is a free WordPress website management dashboard that does exactly what I need: It monitors all my sites and indicates what sites need WordPress, theme, or plugin updates. What’s more, it’s free and very easy to setup and use. 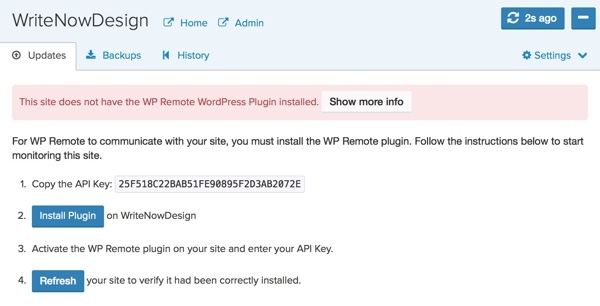 The following tutorial explains how to add and configure sites in the WP Remote dashboard. Note: You have to repeat this procedure for each website you want to add. 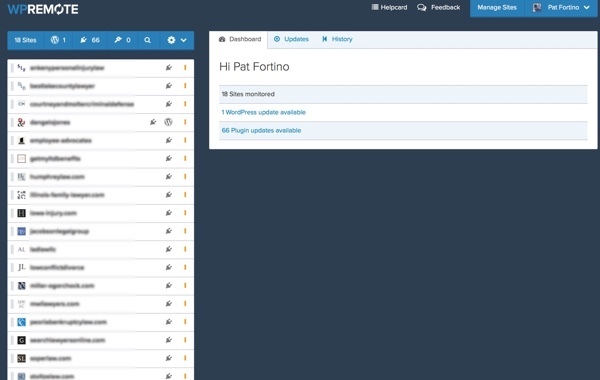 The WP Remote dashboard is displayed. Sites that require WordPress or plugin updates are indicated by a vertical orange bar to the right of each site. To add a new site, click the gear icon above the site list and click Add Site. The Add New Site configuration screen is displayed. Enter a site name and URL and click Add Site. The website dashboard is displayed. Paste the API key you copied and click Save API Key. WP Remote verifies that the API key is correct. Return to the WP Remote dashboard and select the new site from the site list. If the site dashboard indicates that the plugin is not installed, click the refresh button in the top right of the site dashboard. After you click the refresh button, your site should like similar to the screen shot below. 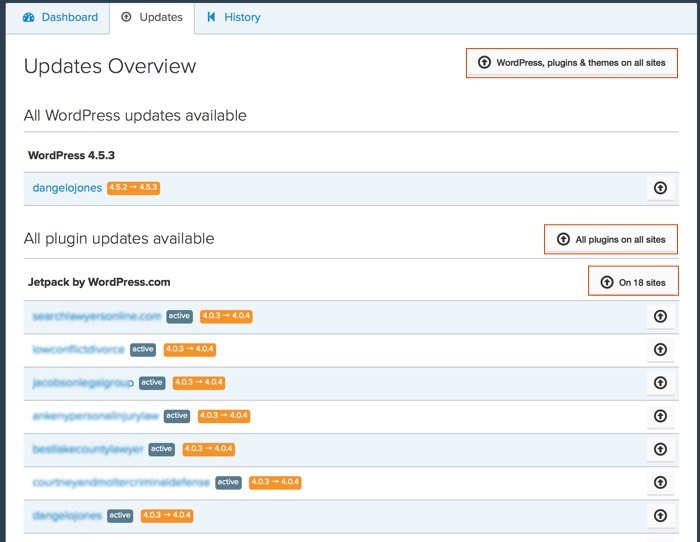 The site dashboard will indicate if there are updates for WordPress, themes, or plugins. Add additional sites. You can add as many websites as you want. Once you have added all your websites, you can update WordPress, themes, and plugins on all sites with the click of a button. 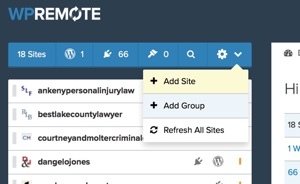 Click Sites in the top left of the WP Remote Dashboard. WP Remote displays the Updates screen. You can also update individual sites. To do so, select the site from the site list on the left. The site dashboard is displayed. From there you can update WordPress, themes, or plugins. Anytime you update WordPress, themes, or plugins, you must test your sites to make sure the updates didn’t break anything. WP Remote provides links to the WordPress admin or website homepage for each website. This makes testing your sites after updates very easy. If you maintain multiple WordPress websites, WP Remote can save you a lot of time by allowing you to update all your websites from a single dashboard. The setup is simple and easy. And WP Remote is FREE! I highly recommend WP Remote for updating multiple WordPress website with the click of a button.